Ready in just 20 minutes, this tasty one-skillet recipe is low in calories, yet packed with heart-healthy nutrients. Studies show that tomatoes help reduce inflammation, blood pressure, and levels of oxidized LDL, a form of bad cholesterol that can lead to plaque in the arteries. In addition, researchers report that people whose diet is high in lycopene (the compound that gives tomatoes their bright-red color) have significantly lower risk for stroke. Heat oil in a large nonstick skillet over medium-high heat. Add chicken and cook 4-5 minutes per side, or until browned and juices from the thickest part of the chicken run clear. Remove chicken from pan and set aside. Reduce heat to medium and cook spinach until just wilted, about 2 minutes. Remove from pan and add onion. Cook for 5 minutes, until softened, then add all remaining ingredients. Bring to a simmer and cook 5 minutes, stirring frequently. 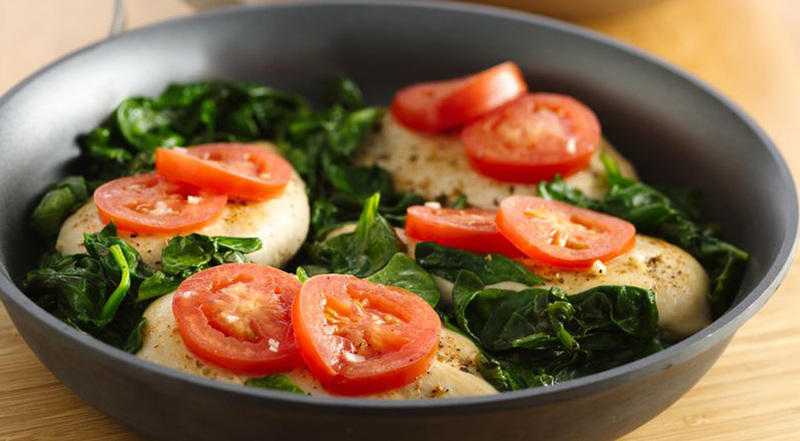 Place spinach on a serving dish and top with chicken breasts and herb-tomato sauce. Serve with brown rice, couscous, quinoa or your favorite pasta. Makes 4 servings. Adapted from Bettycrocker.com and McCormick.com.